We cover a lot of pop culture stuff in our toy coverage here on Kotaku, so today, let's look at something a little different. Action figures based on historical figures. Repulsive, dangerous, bloodthirsty historical figures. Let's begin with a toy company called 3Reich. 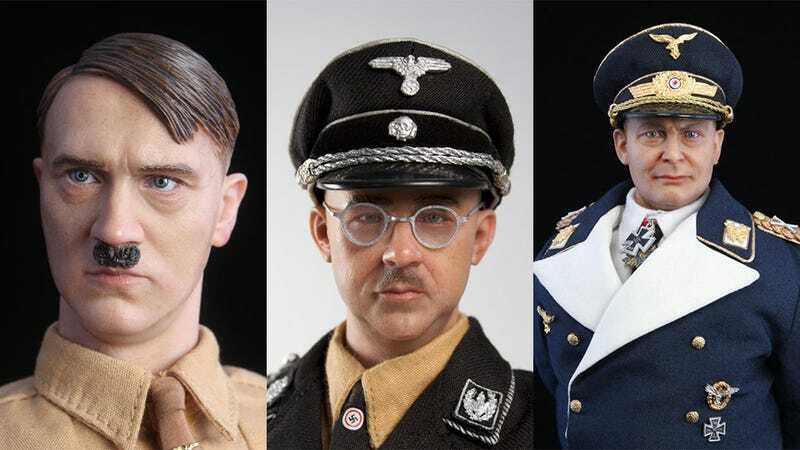 A company whose sole products are large action figures based on the men of Nazi Germany and Imperial Japan. 3R have a disturbingly realistic recreation of Joseph Goebbels, Hitler's Reich Minister of Propaganda and a leading proponent of Nazi Germany's "final solution". A really nice guy who, among other accomplishments, managed to kill his six kids. Next up is another Nazi favourite, Hermann Göring, a fighter ace from the First World War who ended the Second a drug-addled lunatic and one of the regime's most disgusting characters. 3R also have incredibly detailed figures of Heinrich Himmler, boss of the SS and mastermind of the Holocaust, and of course the big man himself, Adolf Hitler. Complete with a "tortured young artist" playset. Getting away from one bunch of murderous psychopaths and focusing on another, another company, King's Toys, have a Stalin figure that comes with a chair, wardrobe change and a revolver accessory. Whether or not his stat card on the back of the box mentions the tens of millions of his own people killed during his brutal regime, I'm not 100% sure. I know there's obviously a market for this stuff, for both serious and joke collectors, but still. Creepy. With one exception: there's one based on badass Japanese actor Toshiro Mifune, as he appeared in 1968 war movie Hell in the Pacific. He looks awesome.